A US intelligence asset infiltrates a private dinner hosted by the Japanese minister to Argentina and discovers a secret anti-US cabal known as the Latin League. 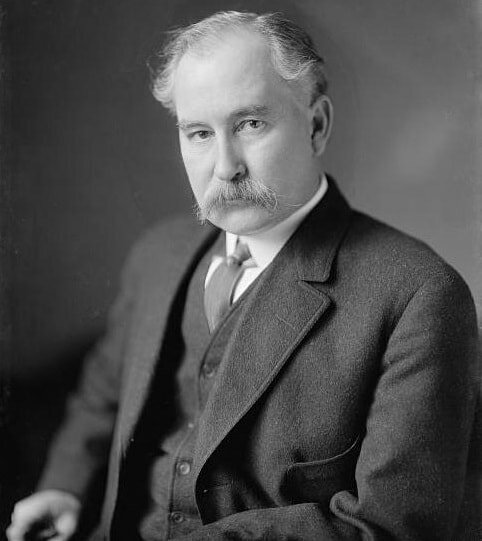 Minister Frederic Stimson was a Harvard graduate, law professor, failed candidate for Congress, and romantic novelist. A US agent in Montevideo, James Shirley, grumbled that he was a lackluster diplomat who was incompetent in intelligence operations. Joseph Guffey, about 1937. He served as US Senator from Pennsylvania 1935-1947. 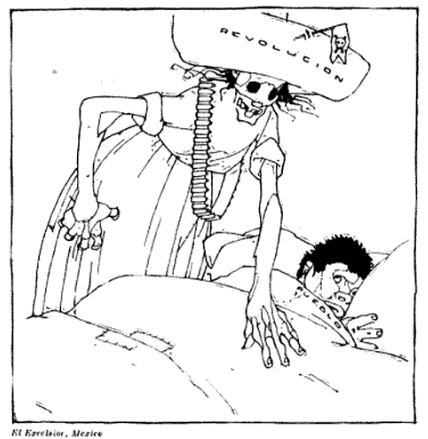 Readers of the non-stop mayhem in revolutionary Mexico were astonished to read Joseph Guffey’s obsequious declarations in the February 27, 1920, New York Times praising First Chief Venustiano Carranza, blaming the predominantly Republican US oil lobby NAPARM for defaming the country, accusing US oil companies of being avaricious cheats, and insisting a bit too earnestly that Mexico was prosperous, stable and well-governed. “I speak from intimate knowledge of conditions in saying the Mexican Government is not attempting to confiscate oil properties developed and operated by American companies,” asserted Guffey with a straight face, in hopes that Carranza would not confiscate assets of Guffey’s Atlantic Gulf Oil Company. Guffey, a stalwart Wilson Democrat, laid it on thick, having no qualms about being a carrancista agent of influence in exchange for sweetheart oil deals at the expense of pro-Republican oil companies. Guffey had dropped out of Princeton in 1892, but not before becoming a disciple of Professor Woodrow Wilson. 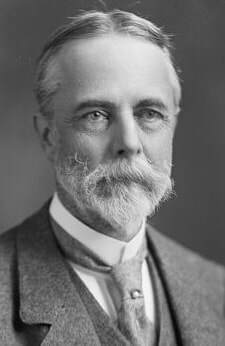 After a few years as a politically appointed postal supervisor, he devoted himself to family oil and gas businesses, became a millionaire, and represented Pennsylvania as a delegate to the 1912 Democratic Convention where he worked with future Attorney General A. Mitchell Palmer to secure the presidential nomination for Wilson. During the war, Guffey secured a position as a “dollar-a-year man” in the Petroleum Division of the War Industries Board and as sales director for the Office of the Alien Property Custodian, where he was charged with misappropriating funds, but never tried. US Cipher Bureau intercepted Mexican Embassy (Washington) message to Carranza reporting Guffey's propaganda efforts on his behalf at the expense of other US oil companies. 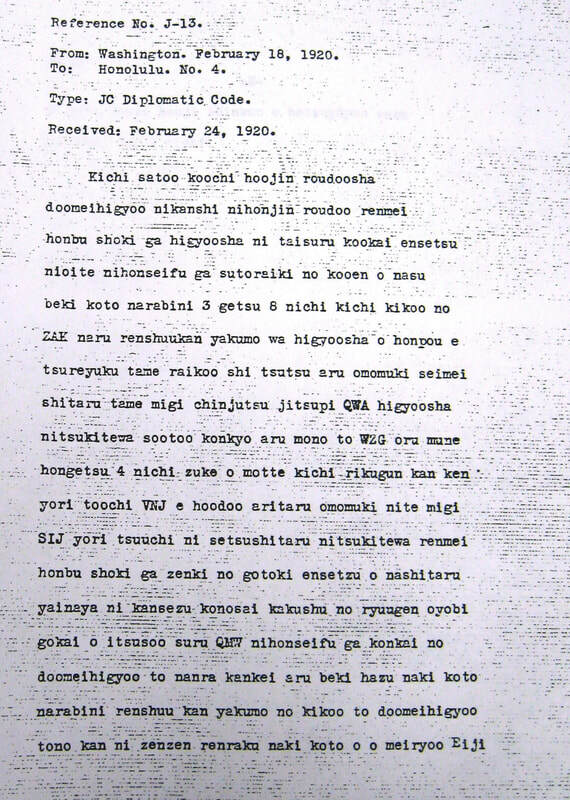 The US Cipher Bureau, a joint signals intelligence organization of the State and War Departments, was able to intercept and decrypt Japanese diplomatic code JC in early 1920. Colonel T. Worthington Hollyday, US military attaché to Denmark, warned Washington in a secret telegram: “Have obtained information from an apparently reliable source of an agreement between Mexico, Japan and Spain in case of war between Japan and the United States and Mexico and the United States.” Surveillance, signals intercepts and “black bag jobs” in Denmark and elsewhere suggested that the anti-US military pact might be genuine. US State Department eavesdroppers intercepted a “highly interesting” cable between Mexican diplomats mentioning secret negotiations in Madrid with the Japanese and Spanish governments. 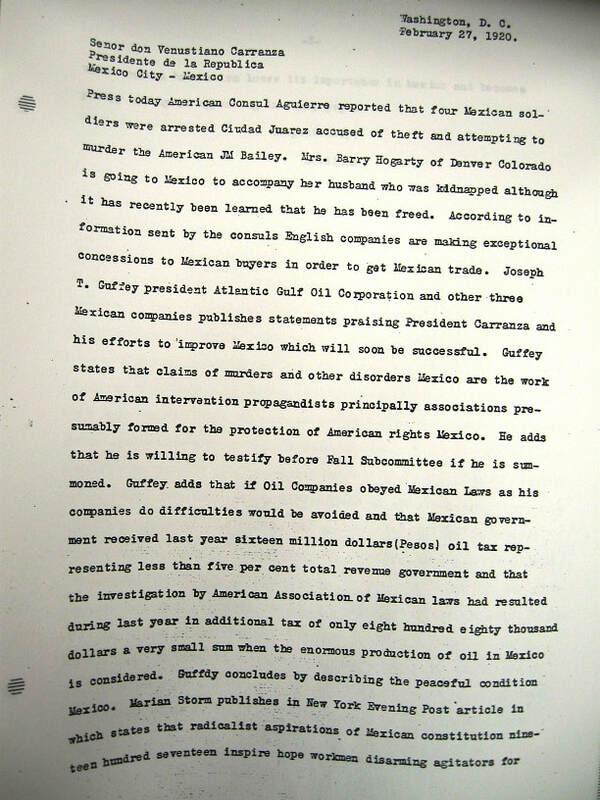 Information about a Japanese-Mexican pact swiftly leaked to US Senator Albert Fall and reporters. 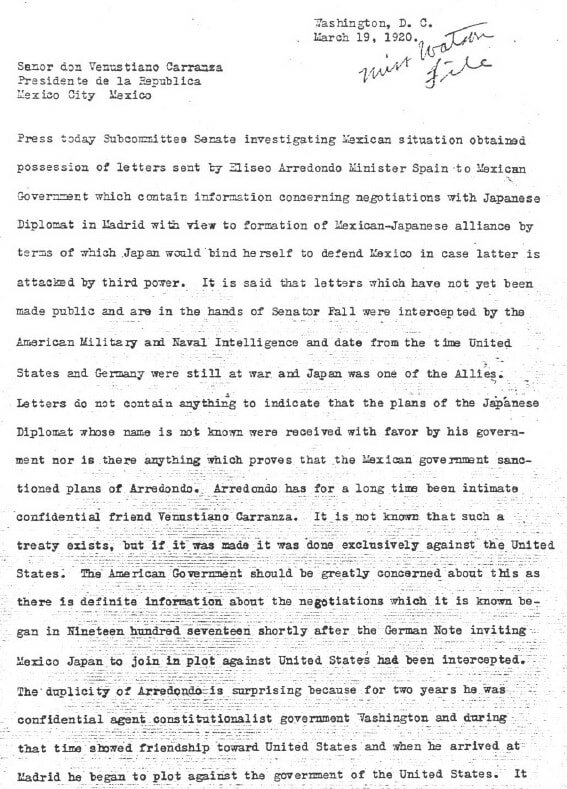 Within hours, US newspapers announced that the Fall subcommittee on Mexican affairs had obtained letters prepared by the Mexican Ambassador to Spain, Eliseo Arredondo, regarding negotiations with Japanese diplomats in Madrid for defensive and offensive military pacts. The pact may indeed have been genuine, but the North American newspaper articles were riddled with errors, half-truths and quibbles. Regardless, headlines were dominated by President Woodrow Wilson’s final failure to convince the US Senate to ratify the Versailles Treaty, and the war-weary public did not take heed of the secret pact. 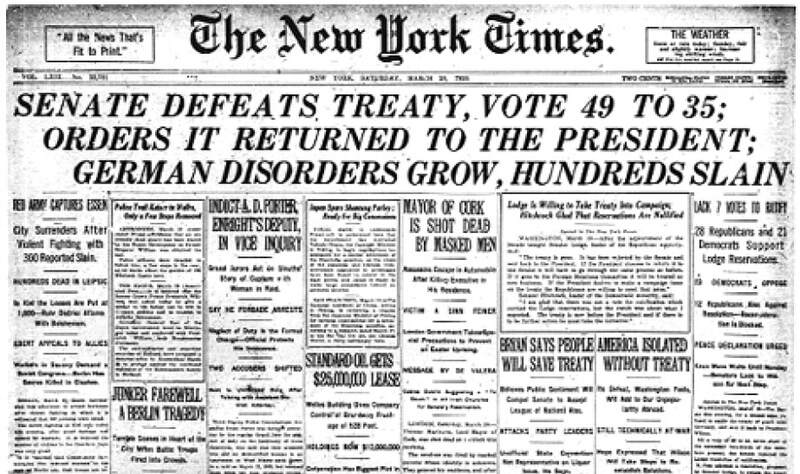 Headlines were dominated by news of the US Senate snubbing the Versailles Treaty, which overshadowed articles about the purported pact between Mexico, Japan and Spain. 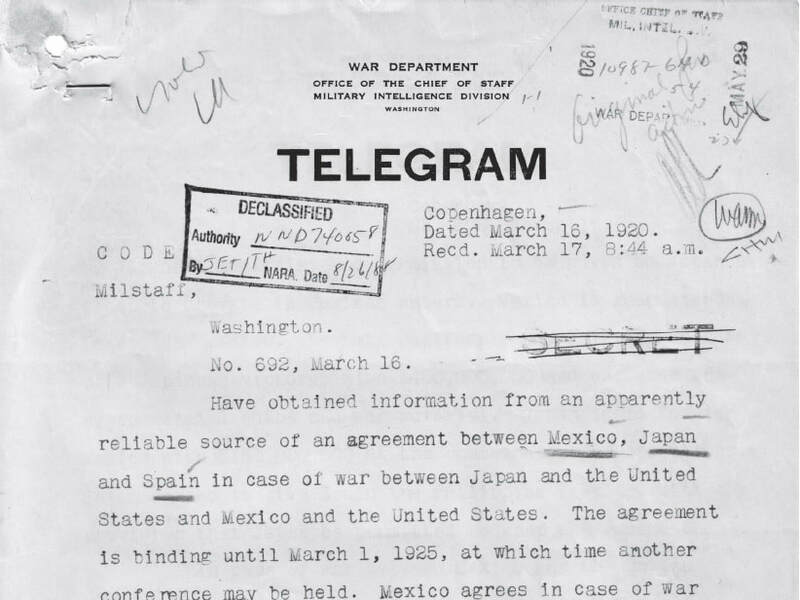 US Cipher Bureau intercept of the Mexican Embassy's daily telegram to President Carranza on March 19. Manuel Estrada Cabrera, Guatemala's murderous dictator president since 1898, is declared insane by the National Assembly, which elects Carlos Herrera as provisional president. Risking their lives, members of the National Assembly had suddenly gathered at 9 a.m., read a list of “grave charges” against Estrada Cabrera, then formally declared him insane. They elected unionista Carlos Herrera as provisional president of Guatemala. Agents of el Presidente tried to break up the meeting but failed. Troops that were sent to break up the Assembly were turned away by excited throngs several blocks away. This drastic action by the Assembly was the culmination of months of plotting by secret cells of Partido Unionista activists and supporters. With no army of its own, the Assembly was grabbing the reins of power from a madman who was armed to the teeth. Failure meant death or exile. At 1 p.m. the National Assembly adjourned and news of their bold action spread like wildfire. “There was the wildest joy and excitement throughout the city,” reported US military attaché Major Louis O’Donnell. “Church bells were rung, and crowds paraded through the streets shouting “Viva Guatemala libre!” But 34 days of vicious fighting and bloodshed would follow before the tyrant surrendered power. 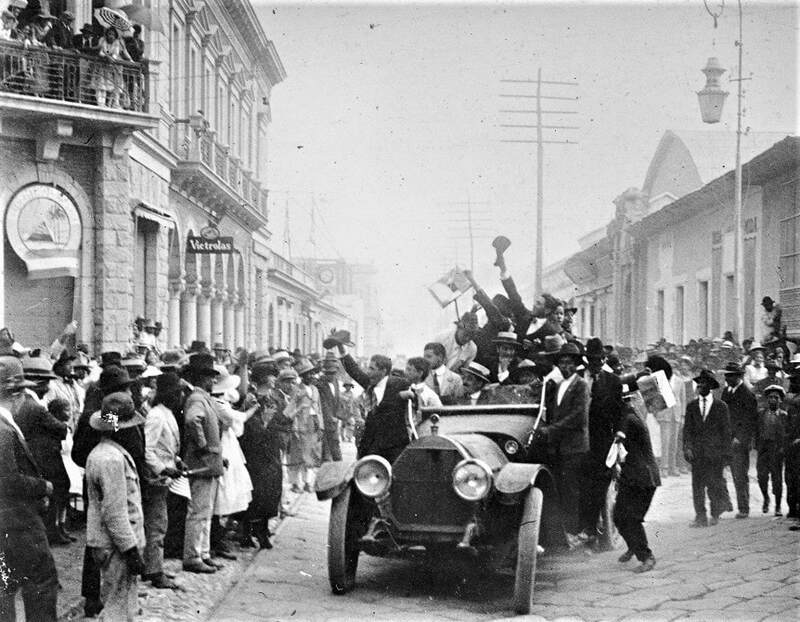 Joyous people thronged Guatemala City streets on April 8, 1920 to cheer the National Assembly’s brave action against dictator Estrada Cabrera. This photo may have been taken 34 bloody days later when the tyrant finally surrendered. Mexico's First Chief Venustiano Carranza is assassinated. By the time of Carranza's assassination in 1920, Mexico was too war-weary to be roused by revolution anymore (The Independent, Vol. 102, p. 325, 1920). 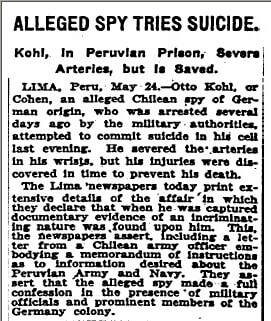 ​Peruvian counterintelligence rounds up a Chilean spy ring led by Otto Kohl, a German operative who had been seconded to Chilean military intelligence. Mexico was the only Latin American nation to have delegates at the Second Comintern Congress in Petrograd in mid–July 1920, though none were actually Mexican. ​Colonel Mario Monteforte, hitman for former dictator Estrada Cabrera, flees to the US via Honduras. A US naval intelligence agent purloins the waste basket of the British naval attaché Captain Charles Backhouse and finds evidence indicating secret meetings with German and Japanese intelligence officers.